Ben Davidson and Wilder Boyden take spots on medal stand for 1500 meters in 4A track. With only two members, they placed sixth in team standings. 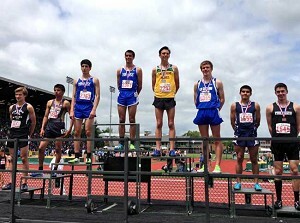 BEAVERTON — With just two members, the track team from Valley Catholic managed to take sixth place in the 4A state meet last month. Valiant senior Wilder Boyden won both the 3,000 meters and 1,500 meters. With his teammate Ben Davidson, the two were in territory usually occupied by much larger teams with more people to score points. Davidson finished fourth in the 3000 meters and third in the 1500. Boyden and Davidson were part of the Valley Catholic cross country team that claimed the 4A crown in their first year at that level.